The NFL's drunk driving and domestic violence issues have improved after the watershed events of 2014, according to analysis by USA TODAY Sports. No other year in NFL history was quite as busy for law enforcement as 2006. NFL players were arrested or cited at least 71 times for various alleged crimes, including 10 incidents for the Cincinnati Bengals alone and 20 arrests for players suspected of driving drunk. The problem got so bad that the league was forced to crack down on it after hiring Roger Goodell as the NFL’s new sheriff that August. But it didn’t quite work. Another surge of criminal cases disrupted the league in 2013 and 2014, prompting it to revamp its strategy. 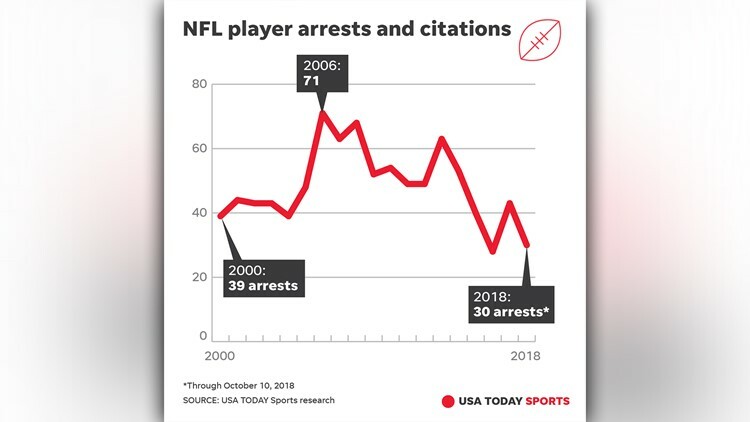 NFL player arrests and criminal citations have dropped to about 38 per year since then, compared to about 57 per year in the 10 years prior, according to an analysis of the USA TODAY Sports database of more than 900 such incidents involving players since 2000. Arrest rates for drunken driving and domestic violence both have fallen in step. DUI arrests are down to about nine per year since January 2015, compared to 15 per year from 2005-2014. Domestic abuse arrests dipped from about seven per year from 2005-2014 to about five per year since 2015. And the Bengals have had only four known incidents since then, cooling their bad boy image after a rash of incidents in the previous decade. Nobody’s celebrating, however. The league still considers one arrest to be too many, even if that might not realistic. At the same time, the data shows that the league experienced a watershed year in 2014, leading to changes that seem to be lasting. That September was when a video went viral of running back Ray Rice punching his then-fiancee in a casino elevator. The outrage that erupted over his lenient two-game suspension soon hurled the league into a public relations crisis, compelling it to crack down on player conduct again and toughen its approach to domestic abuse. The past four years also marked a transformation in punishment and prevention for driving drunk. That same September, the league and players union agreed to two-game suspensions for first-time DUI offenses instead of fines. Meanwhile, ride-share services such as Uber and Lyft have exploded in popularity, making it easier to get home safely after partying. Last year, the players union announced a partnership with Lyft in which active players would be eligible to receive $250 in ride credits. That and other changes by the league have led to a significant reduction in such incidents, though some issues persist and some teams do better than others. While the Bengals appear better behaved, the Green Bay Packers and New York Jets lead the league with 11 arrests or citations since 2015. The Minnesota Vikings and Denver Broncos have the most incidents since 2000 with 51 and 50, including three and five since 2015, according to the database. To provide context on player conduct issues that have challenged the league, USA TODAY Sports has tracked NFL arrests and criminal citations of active NFL players since 2000. Some incidents come to light later or avoid detection. The list of 900-plus incidents are overwhelmingly misdemeanor cases, often resulting from traffic stops, with drunk driving remaining the league’s biggest criminal problem – about 25% of all NFL arrests. The problem turned especially tragic in December 2012, when Dallas Cowboys defensive lineman Josh Brent drove drunk and crashed in an accident that killed his teammate and passenger, Jerry Brown. Brent was convicted of intoxication manslaughter in 2014. The NFL toughened its DUI punishment later that year. “You don't want to be the guy that's putting a black eye on your team,” Jets offensive tackle Kelvin Beachum said. “And I think organizations as a whole have made a point that if you do this, you may not be the guy for us. And the leash for some people is not as long as it is for others. So it's a give-and-take for both ends, the organization and the players understanding the ramifications and consequences for some of the things that go along with DUI arrests and things of that nature." The league had at least 35 combined DUI arrests in 2012 and 2013, compared to about 20 over the last two years, part of a culture change that emphasizes both prevention and increased accountability. Take the case of Jameis Winston. Early one morning in 2016, the Tampa Bay quarterback got into the front seat of a ride with Uber. Though he may have prevented a DUI arrest by not getting behind the wheel, the female driver accused him of grabbing her crotch in the car while waiting in line at a drive-thru restaurant in Arizona. Winston wasn’t arrested or charged with a crime. But the NFL investigated and concluded Winston had touched the driver in an inappropriate and sexual manner without her consent, a form of sexual assault, which is another big emphasis now in the league’s annual social responsibility education program for players and staff. This has helped the league also make progress with domestic abuse, part of which might be measured by the dip in arrests for such cases since 2015. Tougher punishment plays a role, too. Before the Rice video aired, the NFL had been historically lenient on domestic violence cases, usually never punishing a player with more than a one- or two-game suspension. The NFL since increased the discipline for first-time offenses to six-game suspensions, even if the player hadn’t been arrested, subject to various circumstances. Last year, the league handed down a six-game ban for Dallas Cowboys running back Ezekiel Elliott, who hadn’t been arrested but still was punished by the league based on domestic abuse evidence it found to be credible. It was another example of the NFL holding players to an elevated standard that goes well beyond the requirements of the criminal justice system, often with pushback from players and their union. The league often has pointed out that its player arrest rate historically has been lower than that of the general population, even during its worst years for arrests, a claim that is supported by a 2015 study conducted by the University of Texas Dallas involving males ages 20-39. USA TODAY Sports also found that roughly one-third of NFL arrest cases lead to acquittal or charges being dropped without punishment. The remaining two-thirds end up with some type of legal punishment after plea deals, convictions or diversion programs. Beyond that, thousands of players participate in the league each year without incident, considering that team rosters often change and expand to 90 players in the offseason. But the crises of four to five years ago still demanded more from the league. Big criminal cases especially can dominate the public conversation about the league, as they did with the Rice video or when tight end Aaron Hernandez was charged with murder in 2013, less than a year after he signed a five-year contract worth up to $40 million. “It was critical that the NFL responded to the high-profile, high-visibility cases in the manner they did,” said Alex Piquero, a criminologist at UT Dallas who has conducted research on NFL player arrests, including this year on how crime in college predicts violent crime in the NFL. Protecting the NFL shield – its image and brand -- is why it matters to Goodell and team owners. Their players are highly paid public figures who attract media attention with any incident involving police. Sponsors and consumers are paying attention, even if it always will be a work in progress with new young men coming into the league each year, usually around age 21. Continued progress is a more realistic goal. “We feel it’s trending in the right direction,” Isaacson said.